Eastern states weren't the only ones to see drum corps competitions this Fourth of July weekend. 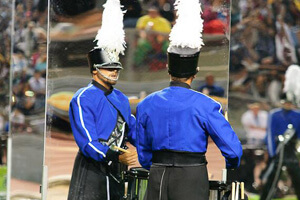 The West Coast played host to four DCI events in Oregon, Washington and California, with many Open Class corps making their debut performances of the 2010 season at these competitions. The Santa Clara Vanguard Cadets took first place in three events: July 2 in Salem, Ore., July 3 in Hillsboro, Ore., and July 5 in Tri Cities, Wash. 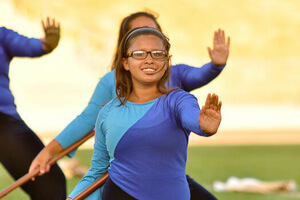 Reaching first place in its respective shows, Gold from San Diego, Calif., scored a 72.150 in Riverside, Calif. July 5. Though the corps will not compete at the Open Class World Championships this August in Indiana, corps members are already performing at a high level and proving that they can hold their own among the top groups. 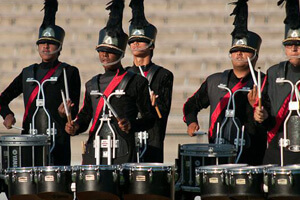 "It's just straightforward drum corps," said Gold Director Donald Flaherty about the corps' production, "Primary Colors." "There's no deep, dark story behind it. We're just putting out a show that the crowd seems to be responding to and enjoying." Though Gold took first place in the shows it performed in this past weekend, Flaherty says the scores are the least of his concerns. "The number one thing is that the kids have a good experience. Competitively I never even look at scores; I look at whether the kids are having a good time and learning something. After the shows when I see the kids in the parking lot, they're laughing, they're excited about what they're doing, and they're already talking about next year. [Our focus] is on the kids and remembering we are there to entertain the audience." San Antonio based Revolution also had a successful weekend, improving by about three points in three days. This year, the corps performs "Fade to Black," mixing contemporary classical music artists such as Eric Whitacre and John Mackey with the likes of Muse and Steve Vai. Following Revolution was Impulse, who came in just a tenth of a point behind in the Riverside, Calif. Western Corps Connection. "The kids are really positive and they're excited. We have a few veteran members but also a lot of new members who've never marched in drum corps, and they love it," said Impulse Director Carolyn Parsons. "What drives [the members] is the personal passion for the music, the camaraderie, and being an Impulse family," Parsons said. "This season, they all get along well and mix well together. The hornline is friends with the percussion and with the color guard... they're all one 'United' family." The Oregon Crusaders ended the weekend with a score of 69.200 in Tri Cities, Wash. after breaking the 70-point margin the day before. The Velvet Knights continue to improve as the corps makes its way through its fourth season since returning to Open Class competition in 2007. Thunder is also back at it after temporarily merging with the Cascades in 2009. Previously Spokane Thunder, the corps is working hard to re-establish itself in 2010 with a production called "Resurrection." City Sound of Long Beach, Calif. made its debut as a new Open Class corps with solid showings this weekend in Walnut and Riverside. As World Class corps have been breaking the 80-point mark on the East Coast, the trend continues out West. The Blue Devils took the top spots in their weekend competitions, improving by nearly four points. The defending World Champions almost caught the Cadets for the highest score of the season, scoring 84.500 in Riverside on Monday. Santa Clara Vanguard stayed competitive as corps members continue to work out the kinks in a recently learned ending to their 2010 production "Bartok," and the Blue Knights are now knocking on the 80-point door with "Europa," improving by almost four points from their July 2 performance. The Academy maximized its rehearsal time since its last competition in Arizona on June 23, improving by several points. It was a roller coaster weekend for the Troopers who jumped up two points in Hillsboro, Ore. on Saturday, only to fall back one in Tri-Cities, Wash. on Monday. Pacific Crest of Diamond Bar, Calif., is also showing steady improvement, raising its score by two points from July 2 to July 5. The Mandarins were passed by the Cascades in Hillsboro but came back on top in Riverside on Monday. The Cascades surprised many this weekend with their debut performance on Saturday which was nearly five points higher than the corps' first competition in 2009. SoCal Dream was the only all-age corps involved in West Coast DCI Tour events this past weekend. The corps will perform again July 10 in Sunnyvale, Calif. View a photo gallery of corps in Walnut, Calif. Complete performances of July 3 performances in Walnut, Calif., are now available for on demand playback on the DCI Fan Network. Learn more about viewing these videos. Photos courtesy Chris Maher, corpsreps.com.